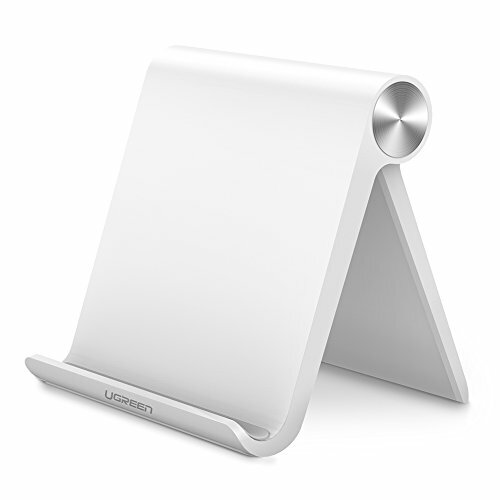 UGREEN Tablet Stand Holder for iPad, Samsung Galaxy Tab, Nintendo Switch, Apple iPad Pro 10.5, iPad Mini, iPad Air, iPhone 7 6 Plus X 6S 8 5S, LG Android Tablets and E-Readers, Adjustable (White) | Replicafer Co.
PORTABLE SIZE: 120mm*107mm (4.7inch*4.2inch), UGREEN handy holder for ipad is foldable and easy to slip into your pocket. MULTI ANGLE ADJUSTABLE: Directly adjust to your preferred angle among 10 different viewing angles from 0° to 100°. Hold your cell phone or tablet securely in vertical and horizontal mode. DESKTOP STAND HOLDER DOCK: Hold your smartphone or tablet at a comfortable angle, ideal for watching videos, reading, video recording or simply browsing the web, facetime and other handsfree operation no matter on countertop in kitchen or end table in living room. UNIVERSAL COMPATIBILITY: Work perfectly with all 4 to 10.5inch smartphones, tablets and e-readers like iPhone XS Max XR X 8 8 Plus 7 7Plus 6S 5S 5C, 9.7 inch iPad, iPad mini 2 3 4, iPad Air 2, new iPad 2017 Pro 10.5", Nintendo Switch console, Samsung Galaxy Note, S9 S9+ S2 S7 Edge S6 S5 S8 J7, Google Pixel 2 XL, Nexus 5X 6P 7 10, LG K20 K10 G5 G6 V20 etc. PREMUIM MATERIAL: Superior ABS and rubber pad on the bottom protect this sturdy mini desk stand from sliding.